Pune based On demand websites & mobile app development services Aggregator startup, ClickExcel.com Private Limited claimed that bringing all website & mobile apps development related services for small & medium size businesses like domain registration, web hosting, web development, mobile app development & digital marketing under one umbrella. 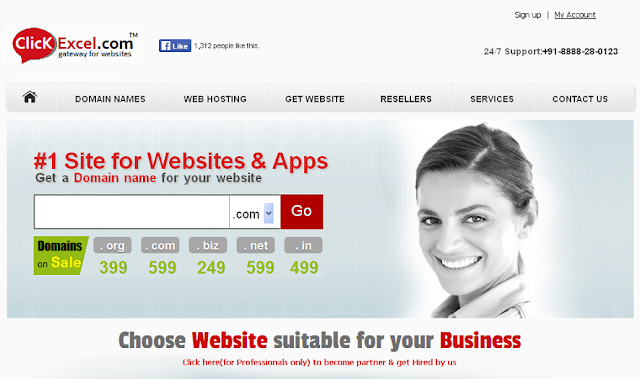 Founded in December 2015 by Pandit Kadam, ClickExcel.com claims to have more than 150 freelance web developers & digital agencies on its platform, allowing clients to book web services, such as domain registration, web hosting, web development, mobile app solutions and digital marketing services. ClickExcel.com claims that it books clients order online and serves it instantly, orders related development are delivered online on the preferred time period of a client, if client prefer to visit company agent to his place, it also served at free of cost within 24 hours of time after placing order. The company currently offer its services via web. The company's Android app & iOS app will be released soon. In a recent statement released by the company stated, The company is on the move to strengthen its team by hiring people in technology, operations, sales and marketing department. India is a growing market and is welcoming of new concepts in recent times. The startups competes with other online services marketplace players such as Urbanclap, Localoye & Zimmber and many others that have already got funded in this service sector marketplace for unique concept. "Differentiation factor is that this startup focusing & targeting only website & mobile apps services instead bulk of all catagories like Urbanclap & Zimmber, so that able to provide services to clients more excelent ways", said Pandit Kadam, founder at ClickExcel.com. The platform is self-funded till date. The company is not aggressively looking to raise funding right now. However they will start looking for funding after 2-3 months to expand operations and offer more services. Once we have a decent footprint, we will go for funding which we intend to use to expand further. Currently Company have started operation in India only, plans to receive 100 orders a day in the next one year.